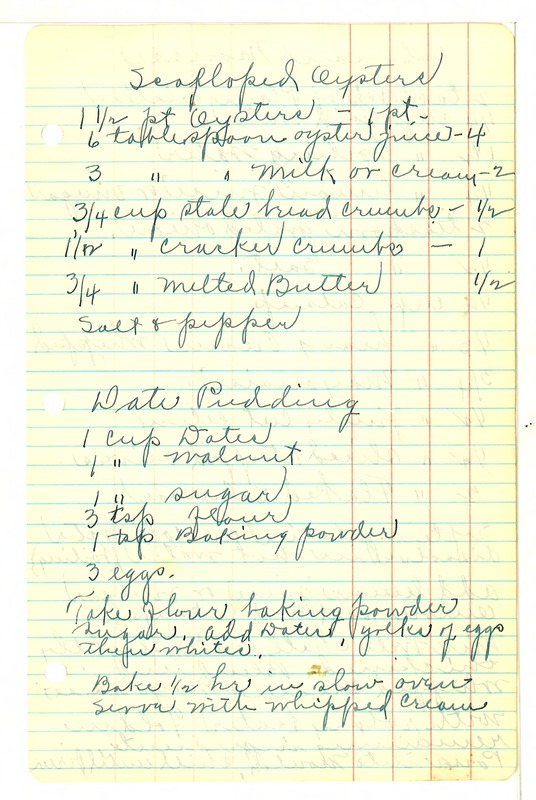 Scalloped Oysters 1 1/2 pt oysters - 1 pt 6 tablespoon oyster juice - 4 3 " " milk or cream - 2 3/4 cup stale bread crumbs - 1/2 1 1/2 " cracker crumbs - 1 3/4 " melted Butter 1/2 Salt & pepper Date Pudding 1 cup Dates 1 " walnut 1 " sugar 3 tsp flour 1 tsp Baking powder 3 eggs. Take flour baking powder sugar, add Dates, yolks of eggs then whites. Bake 1/2 hr in slow oven. Serve with whipped cream.